Revlon Photoready BB Cream: I bought this product because I wanted something lightweight to wear on Saturdays, to the gym and over the summer. I'm not blessed with flawless skin, so going out sans makeup, it not an option for me. What I like about this product is, it works as a lotion, foundation and sunblock all at once. It has SPF 30 in it which is great, and it does a good job blurring imperfections. It's easy to rub on before I go to the gym. I'm not one to go to the gym with a naked face. I like a little help. So this BB cream with a little mascara and lip gloss is perfect for giving me a little pick-me-up on Saturdays morning for the gym. Even though I get sweaty, I still feel like it helps keep my skin tone balanced. 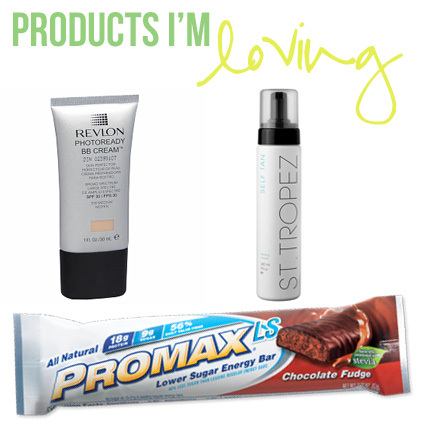 Promax LS Energy Bars: I've been trying to eat healthier lately and get more protein and fiber in my diet. Recently, Nathan discovered these Promax LS bars and I've become obsessed with them. They have 18 grams of protein, 14 grams of fiber and only 9 grams of sugar. When it comes to energy bars, you want to be mindful of the sugar. The chocolate fudge is my favorite, but I also like the peanut butter chocolate. I love that it feel like I'm eating a candy bar, but it's actually healthy for me. St. Tropez Sunless Tanning Mousse: I've been using this St. Tropez sunless product for a few years now. It is by far the best sunless tanning product I've found. It covers smoothly, evenly and easily. It does have a slight smell but it fades within 20 minutes of using it. You look brown after the first use and it lasts for days! I highly recommend this product if you are looking to get a healthy tan. I usually put it on after my nightly shower, and the next day when I take a shower, I'm left with a healthy looking glow. Off to the gym with BB cream on!